The bone may divide into according to the shape: Long bone, short bone, flat bone and anomalous bone. Becomes human bones altogether 206, according to locates the spot differently in vivo to be possible to divide into: Skull, bones of trunk and four bones of the four limbs. The skull divides the brain skull dough making skull, altogether 23, bones of trunk altogether 51, four bones of the four limbs altogether 126, and some 3 pair of ear bones located at nie bone. The bone mainly by the ossein, the marrow, the periosteum constitutes. (1) ossein: Namely bone tissue, also divides the bone dense nature and the bone substantia spongiosa.①The bone dense nature, mainly distributes in the long backbone and other bone's surface.②The bone substantia spongiosa, constitutes by bone young Liang, located at bone's. (2) marrow: Backfill in medullary cavity of bones and substantia spongiosa cavity crack. Also divides the yellow marrow and the red bone marrow, the red bone marrow can the hemopoiesis. 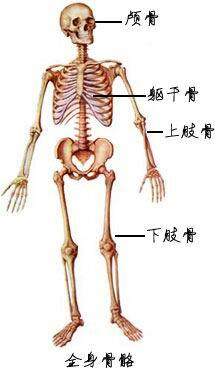 In adult qia bone, breastbone, vertebra life-long retention red bone marrow. (3) periosteum: Contracts the organization by the compact knot to constitute, located at the bone most outside, includes the rich blood vessel, the nerve and the osteoblast. In bone's growth, has, in the repair and the reconstruction the influential role. According to the bone linked structural style, may divide into links directly with links indirectly. (1) links directly: Links, the cartilage including the membrane to link, the osseous to link. (2) links indirectly: Namely joint. Joint's structure is various, but the fundamental construction is the same. (1) fundamental construction: Including facies articularis, ligamentum capoulare, ticulare. (2) auxiliary structure: Including in ligament and joint cartilage and so on. (1) Qu Heshen: Is revolves the coronal axis the movement. (2) adduction and abducts: Is revolves the arrowy axis the movement. outside (3) turns on lathe and turns on lathe: Regarding the vertical axis is movement. (4) circles: Is bends, abducts, extends the movement which, the adduction links. Namely near side end motionless distalis end makes the circular motion.